Hi, I am interested in your 1973 Chevrolet Corvette (stock #1157-NSH) listed on Autotrader for $23,995. I'd like to get more information about this vehicle and confirm its availability. 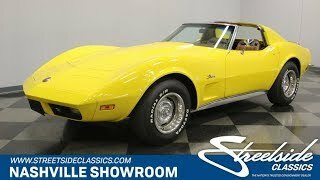 1973 started Corvettes transformation from muscle car to sports touring car. What that means is that the car kept its substantial sports car capabilities, but became a bit quieter in the cockpit and more comfortable to drive. This particular 73 Vette has spent the last 18 years in the well cared for personal collection of Ronnie Barrett. Ronnie and his son, Chris Barrett, had personally rebuilt the original small block 350CI V8 into the stroked out 383CI V8 that lives under the hood today. Masters of their own craft of firearms, Ronnie and Chris attention to detail carried over into this C3 Corvette. Come on down and see for yourself. Its a sweet combination of performance and comfort with a 4-speed manual gearbox that insures you stay engaged on the performance end of the equation. Yellow sports cars just look like they are ready to head out and have some fun. The color works particularly well on this Corvette in part because it is the first year with the molded front bumper, so the color reaches all the way forward and down surrounding the lower grills. Crossed racing flags grace the hood between the hideaway headlights that allow a smooth flow of color up and over the flared fenders that have defined the muscular looking front end of the Vette for years. There is a power bulge on the hood and a steeply raked windshield that flows over body colored T-roof panels when they are in place. The rear sail panel blends smoothly with the flared rear fenders as they curve down toward the integrated rear spoiler for a super clean look at the rear. A bit of chrome dresses out the rear with the luggage rack and the last of the chrome bumpers adding a splash of flash. Open the door and you will find a comfortable place to burn up some backroads or burn up some miles. It is a Brown interior but with the variations in textures and materials, presents kind of a gentle two-tone effect. The door panel has rectangular panels with a long comfortable armrest for cruising. Comfortable high-backed bucket seats have a breathable seating surface with smooth vinyl bolsters. Between them is a nice center console with a padded armrest and the shifter for the 4-speed manual transmission is just a flick of the wrist away. A deep dish 3-spoke steering wheel with a crossed racing flags center button sits in front of a stock dashboard with a 160 MPH speedo on the left and a tach on the right. Engine gauges are mounted in a pod in the center of the dash just above the Corvette FM/Cassette deck. Under the hood you will find a 383 cubic inch stroker motor with significantly improved torque and horsepower over the stock 350. There is no real drama here. No fancy chrome or flashy decals, just a neat and clean motor making more power. There are signs of good regular maintenance with all the belts and hoses and ignition components looking fresh and an old school style cold air intake with a smaller air filter top capturing the filter so it can catch fresh air from all directions. Power flows back through a wide ratio 4-speed manual trans to a Posi traction rear axle, because they started putting those in all Vettes as standard equipment by this year. The front is kept under control with coil springs, shocks and a beefy sway bar and power steering while the rubber meets the road through 225/70R15 tires mounted on steel rally wheels with polished trim rings and bowtie center cap. Come on down and check out this Yellow Vette. Its looking to go out and have some fun, but it needs a designated driver.